December 31, 2010 - Americans across the country are planning their New Year's celebrations. But during this exciting time of parties and resolutions, it's important to keep safety in mind. The fact is, New Year's Eve can be one of the most dangerous nights of the year on our nation's roadways because of drunk and impaired driving. How big is the problem? In 2008, over 1.4 million drivers were arrested for driving under the influence of alcohol or narcotics. 11,773 people were killed in alcohol-impaired driving crashes, accounting for nearly one-third (32%) of all traffic-related deaths in the United States. Of the 1,347 traffic fatalities among children ages 0 to 14 years in 2008, about one out of every six (16%) involved an alcohol-impaired driver. Of the 216 child passengers ages 14 and younger who died in alcohol-impaired driving crashes in 2008, about half (99) were riding in the vehicle with an alcohol-impaired driver. In 2009 alone, 10,839 people were killed in drunk driving crashes, representing 32 percent of all traffic fatalities for the year. That's why DOT's annual "Over the Limit, Under Arrest" winter holiday crackdown is currently under way, helping to raise awareness and get drunk drivers off the streets. Every day, 32 people in the United States die, in motor vehicle crashes that involve an alcohol-impaired driver. This amounts to one death every 45 minutes. The annual cost of alcohol-related crashes totals more than $51 billion. But there are effective measures that can help prevent injuries and deaths from alcohol-impaired driving. Law enforcement officers across the country are stepping up visibility and increasing vigilance as part of the campaign. And the new "No Refusal" initiative DOT is promoting nationwide will help ensure that drivers suspected of being under the influence will face the strictest penalties possible for their actions. But ultimately, putting a stop to drunk driving begins with personal responsibility. Organizations like MADD have told us the stories for years, of a fun evening out with friends that took a tragic turn because someone made the poor decision to drink and drive. Who is most at risk? Young people: At all levels of blood alcohol concentration (BAC), the risk of being involved in a crash is greater for young people than for older people. Among drivers with BAC levels of 0.08 % or higher involved in fatal crashes in 2008, more than one out of every 3 were between 21 and 24 years of age (34%). The next two largest groups were ages 25 to 34 (31%) and 35 to 44 (25%). Motorcyclists: Among motorcyclists killed in fatal crashes, 30% have BACs of 0.08% or greater. Nearly half of the alcohol-impaired motorcyclists killed each year are 40 or older, and motorcyclists ages 40-44 have the highest percentage of fatalities with BACs of 0.08% or greater (44%). Drivers with prior driving while impaired (DWI) convictions: Drivers with a BAC of 0.08% or higher involved in fatal crashes were eight times more likely to have a prior conviction for DWI than were drivers with no alcohol (8% and 1%, respectively). So, as you head out this New Year's Eve, make a plan. Choose a designated driver. Take public transportation. Call a cab. 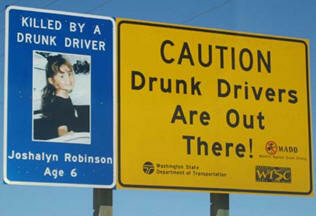 But don't get behind the wheel if you've had too much to drink. It's not worth the consequences. Make 2011 a happy--and safe--new year.